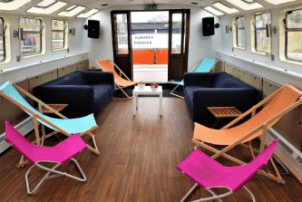 St Columba barge offers you a unique and inspiring venue to host your event. Based on a wide beam boat on the Lea Navigation nestled between the new developments of the Olympic Park and the creative centre of Hackney Wick, we offer the perfect get away. Upon entering the boat, you can immediately feel the peace and tranquillity that the water brings. Usually we are stuck in offices behind desks and computers, which isn’t the ideal environment for creativeness and building trust. That’s why St Columba is perfect for Meetings, Training Days and Team Away Days as we offer a relaxed layout with sofas and deckchairs, helping people to be more open and creative as their physical bodies are relaxed. If you’re after something more formal, the tables and chairs can be arranged into a layout that suits you, all you need to do is ask! Set in a unique location with serene views of London, St Columba is also an idyllic place to build relationships and make an impression, whether you want to run a class or host a dinner party. Enjoy the fresh air by sitting out on the deck in the summer months or put the heating on and cosy up with blankets and candles during the winter. Only a stone’s throw away from the City, you get the feeling of being away from the hustle and bustle, but without all the travel! St Columba is a brand-new project that was launched with the purpose of bringing people together. With so many changes happening in London we want to seek ways to build the community, by hosting activities and being somewhere that people can come to reflect on their life experiences and issues they are facing. By hiring out the space you are helping to fund the mission of St Columba that seeks to develop a sense of community. Whatever idea you have in mind, get in touch so that we can help it come into fruition! Finding us – There is a Here East shuttle bus operating from Stratford station outside Westfield Shopping Centre and Stratford International. It is a free shuttle service that takes people into the middle of Here East and you need to walk down to the canal to find the boat. The name of the boat is called the Elsdale II. Otherwise, the closest tube station is Hackney Wick and is approximately a 5-minute walk from there.